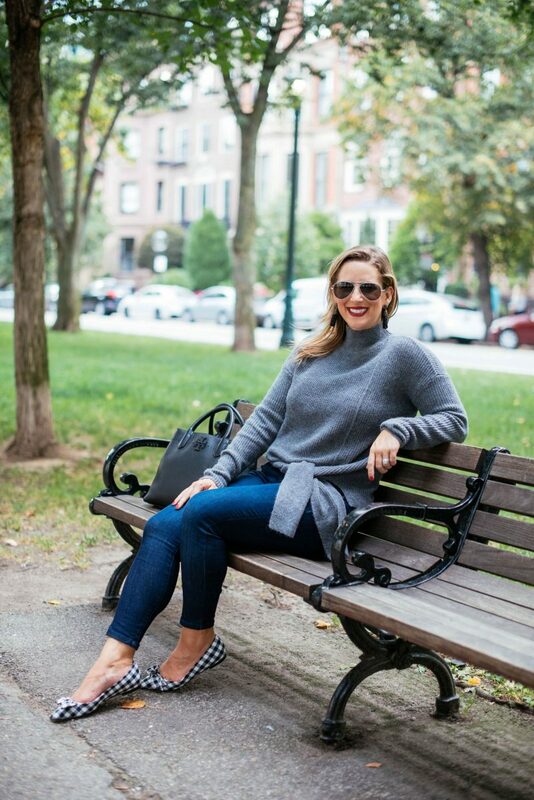 I’m loving all the fun details on sweaters this fall- from ruffles to bell sleeves to tie hems- I feel like your basic sweater is anything but! I picked up this tie hem sweater during the Nordstrom Annniversary Sale and it was one of my favorite pieces from the sale. I’ve been patiently waiting for sweater weather to full arrive here in Boston so I could wear it. While this sweater is only available in limited sizes right now, it’s on sale for around the same price as it was during the Anni Sale! For some more sweater weather inspo, I’m rounding up my fave ruffled sweaters, bell sleeve sweaters and tie hem sweaters for your shopping pleasure below! What’s your favorite embellished sweater trend this fall? How fun! I know, I love how sweaters and really all tops have so many fun details. Looking lovely as ever! I think I need those flats too….